Duel Links has come to life. Hello Pojo Readers, Crunch$G here to welcome you to the newest Yu-Gi-Oh dueling format, Speed Dueling. Speed Dueling is mostly known as the way you play duels in Yu-Gi-Oh Duel Links, but it has now come to the TCG game for you to play in real life. If you want a break from the actual TCG meta, then Speed Dueling might be the best for you as it seems to go back to the beginning of the game’s history with some modifications and it’ll probably speed up much quicker than the actual game did in order to not feel the games are too slow for too long, but that all depends on what cards they release for this format. Today, I’ll discuss the Speed Dueling rules, Skills, and the new Starter Decks and the cards inside to see how viable they might be in a Speed Dueling format. I won’t associate this to the TCG too much, so I won’t talk about how good reprints are cause the main point of this is to talk about these cards in a Speed Dueling bubble. The most interesting thing in this format is what cards they will release in an environment where they really can’t control how many copies of a card a player has, unlike in Duel Links, and what the Forbidden and Limited List will be like and if it’ll work the same as the one in Duel Links. With all that out of the way, let’s get introduced to Speed Dueling. The rules in this format haven’t really changed much from the TCG, but there are still some big changes between this format and the actual duels and they are worth knowing. You should also know before anything else that the only cards you use in Speed Duels are cards watermarked with the words “Speed Duel” as seen in the image. You can use cards with this mark in actual duels, though. Both players start with 4000 LP. The Main Deck must be between 20 to 30 cards. You can have a maximum of 5 cards in the Extra Deck. There is no Main Phase 2. That is basically the standard for what you need to know about how the game flows, the differences aren’t major, the biggest maybe being that there is no Main Phase 2 and that can affect how good certain cards are, but that really goes for all these rules. Each player is allowed to have one Skill card to use. This skill card will give an effect that you can activate after meeting a certain requirement. Some will activate at the start of the duel and act as actual cards, others last throughout the duel and gives you a various effect (sometimes as long as your LP are a certain amount), and others activate after a set amount of turns. The back of the Skill Card will tell you the activation requirements of the Skill and once it is activated, you flip the card over and it’ll tell you the effect of the Skill. Some Skills will help specific decks while others are good generic Skills for if your deck doesn’t have a Skill to really make use of. Skills do not start a chain and they do not go in the Main Deck, but there isn’t a specific spot you have to keep it unless it is a Skill that turns into a Continuous or Field Spell, so just put it somewhere on the field where both players can see it. I don’t think Skills are required, but I don’t know why you wouldn’t want to make use of a Skill. 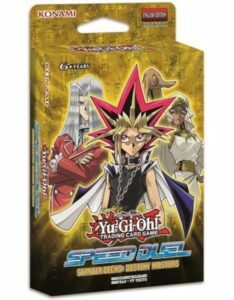 The first set of Starter Decks gives you a deck themed around Yugi, Pegasus, and Ishizu as well as three variant cards, one each to fit the three decks you are given. Shard of Greed is meant to be Yugi’s variant card and can be decent draw power in a format where you likely won’t get access to Pot of Greed that easily, but considering it takes 2 turns for the two draws, I don’t know how worth it the card is with a lack of powerful cards. 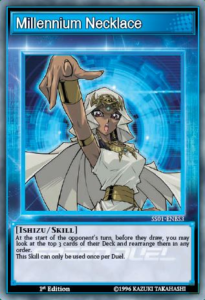 The Golden Apples is Ishizu’s variant card and this can be a useful card in Stall Decks to prevent you from losing your LP, which is easier to do with only 4000, and it gives you a body on board to protect your LP, so again it’ll probably fit into some Stall Decks as the card pool expands. 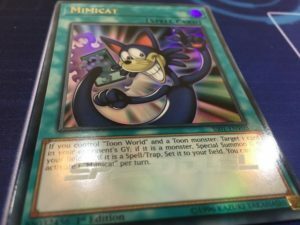 Pegasus’s variant card is Mimicat, which can be useful in a Toon Deck to revive your opponent’s monsters or use their Spells and Traps as your own, and it’ll be easier to see in a 20 card deck with three copies to make up for it not being searchable. The first deck I will talk about is Yugi’s Deck, which isn’t a complete assortment of random cards like you’d expect. The cards in this deck are Dark Magician, Feral Imp, Rogue Doll (x2), Dark Magician Girl, Legion the Fiend Jester (x2), The Stern Mystic, Double Coston, Blue Dragon Summoner, Thousand Knives, Sage’s Stone, Dark Magic Attack, Riryoku, Tribute Doll, Wonder Wand, Lightforce Sword, Magician’s Circle, Magic Jammer, and Seven Tools of the Bandit. I can see somewhat of a viable Dark Magician deck coming out of this with Dark Magician, Legion the Fiend Jester, Blue Dragon Summoner, Thousand Knives, and Dark Magic Attack. Blue Dragon Summoner will easily get you to Dark Magician, and that process is faster if you use it with Wonder Wand for a draw 2 and search, but you’re just leaving yourself open at that point. Legion the Fiend Jester can also search for Dark Magician and can give you an extra Normal Summon if you got the tributes for Dark Magician (Double Coston can help) or you can tribute Legion for Dark Magician Girl and search for Dark Magician and use Sage’s Stone for Dark Magician. Thousand Knives and Dark Magic Attack are good for removal in the deck as well and having Magician’s Circle can get bodies out of your deck. 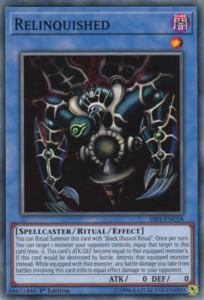 Rogue Doll is one of the better beaters in the game with Double Coston, and that is helped by one of Yugi’s Skills. Riryoku is good for helping smaller monsters get over bigger ones early on in Speed Dueling. Tribute Doll can quickly summon a High Level monster from your hand, useful in that theorized Dark Magician deck I mentioned. Magic Jammer and Seven Tools of the Bandit will give for some good negation early on as well. 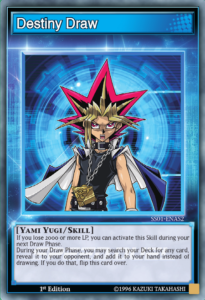 As for Yugi’s three Skills he gets, the first one is Power of Dark, which is activated at the start of the duel in the Field Spell Zone and basically acts as the Yami Field Spell where it boosts your Fiend and Spellcaster monsters by 200 ATK and DEF while it lowers all Fairy monsters by 200 ATK and DEF. This skill might be nice in some decks full of Fiends and Spellcasters to make sure you got some beaters, which will be useful early on in Speed Dueling as most decks might end up just being pure beatdown decks. Destiny Draw can be used when you lose 2000 or more LP during your next draw phase to let you search your deck for any card instead of conducting your normal draw for the turn, after you use the Skill you can only use it again after losing 2000 LP of course, so LP gaining cards like The Golden Apples can be useful with the Destiny Draw Skill. Final Draw is Yugi’s last Skill and can be activated during your Main Phase and once per turn, during your turn, you can place a counter on it and once it has three counters on it, then when you would draw a card you can instead add any card from your deck to your hand but at the end of the turn you use this Skill for the search, you lose the duel. This can be useful when you know you are one card away from victory and you want to guarantee you draw it without having to use Destiny Draw and the LP requirement it has, but you have to keep aware of how high risk this Skill is because once you get that search, you have to finish the game or you straight up lose. Final Draw might find use, but Destiny Draw is overall better cause it doesn’t have the risk of you losing. Ishizsu basically has a Gravekeeper’s Deck. The cards in this deck are Gravekeeper’s Curse, Gravekeeper’s Spear Soldier (x2), Gravekeeper’s Vassal, Gravekeeper’s Chief, Gravekeeper’s Cannonholder, Gravekeeper’s Assailant (x2), Gravekeeper’s Priestess (x2), Gravekeeper’s Recruiter, Gravekeeper’s Shaman, Gravekeeper’s Oracle, A Cat of Ill Omen, Gravekeeper’s Steele, Hidden Temples of the Necrovalley, Sebek’s Blessing, Blast Held by a Tribute, Rite of Spirit, and The Eye of Truth. You got a foundation for a decent Gravekeeper’s deck here except for Necrovalley, the best card Gravekeeper’s have. Therefore Gravekeeper’s Priestess has to be your Necrovalley replacement since she treats the field as Necrovalley. Gravekeeper’s Recruiter is going to be a good searcher for your Gravekeeper’s deck and will be a useful engine for when Speed Dueling gets Silent Magician. Spear Soldier can give you piercing and Assailant helps get over bigger monsters with low DEF. 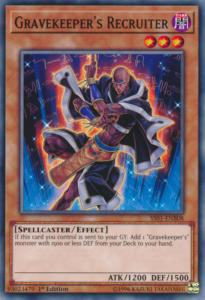 Chief can revive a Gravekeeper’s upon its Tribute Summon, which Legion the Fiend Jester from Yugi’s Deck can help with, and it’ll have your grave unaffected by Necrovalley for when Speed Dueling does get Necrovalley (it took 2 years for Duel Links, so don’t expect it too soon). Rite of Spirit can also be a good revival card for Gravekeeper’s. Oracle can be a good boss monster in a Gravekeeper’s deck with its three effects you can use depending on how many Gravekeeper’s you use to Tribute Summon it. Steele will make for some good recovery in a Gravekeeper’s deck as it does in the actual game. Hidden Temples probably won’t be useful early on, especially without Necrovalley. A Cat of Ill Omen will probably be useful in Stall Decks to help get to your Traps quicker that will help you stall out the game. Finally, Blast Held by a Tribute might be good when there are a lot of Tribute Summon decks running around. Ishizu’s Skills are themed around her being able to see into the future as she did in the anime. Prescience is her first Skill and it is used when your opponent has twice the amount of LP that you do and while the LP are like that, you can look at the top card of your and your opponent’s deck at any time. This is good in a pinch when you want to strategize to get out of a losing situation, you can take a look at the cards coming up in order to know how you want to use your cards to get you out of a losing situation. Gravekeeper’s Lot is activated when you lose 1800 or more LP and during your next Draw Phase, you can search for any Gravekeeper’s monster instead of drawing for turn. This is nice when you take damage and you need a monster to either protect you or to help you win the game, obvisouly useful in decks with Gravekeeper’s monsters and can be nice in the Silent Magician Gravekeeper’s deck I mentioned earler to get a monster to tribute for Silent Magician when that card comes to the game if it does. Millennium Necklace is Ishizu’s final Skill and it can be activated at the start of your opponent’s turn before the draw and it’ll let you rearrange the top 3 cards of your deck, and this Skill can only be used once per duel. If you know your opponent is closing in on victory and it is very dependent on their draw, you can use this Skill at the right time to make sure your opponent gets the worst draw possible and you can take advantage of the situation. This might be one of the better generic Skills for decks that can’t really take advantage of more specific Skills. Mostly this is a Toon Deck with other cards you’d expect from Pegasus. You got Rogue Doll, Toon Alligator (x2), Parrot Dragon, Dark Rabbit, Toon Masked Sorcerer (x2), Toon Mermaid, Toon Summoned Skull, Relinquished, Black Illusion Ritual, Toon Table of Contents, Toon Rollback, Toon World (x2), Yami, Sword of Deep-Seated, Toon Defense, Jar of Greed, and Wild Tornado. Another Rogue Doll means you immediately get 3 just by getting Destiny Masters, but it’ll be powercrept very quickly I’m sure. You got the foundation for a Toon Deck in here already. Toon Masked Sorcerer and Toon Mermaid are easy enough to summon while not giving the more powerful low level Toons like Toon Gemini Elf or maybe even Toon Goblin Attack Force. Toon Summoned Skull will be a nice boss in a Toon deck until we hopefully get Toon Dark Magician Girl. Toon Table of Contents is interesting to let players have 3 of since Duel Links can only get 1 I believe, but this makes up for the fact that the real life Speed Dueling doesn’t have Toon Kingdom. Toon Rollback will be nice for some extra damage in a Toon deck to end the game faster since your monsters aren’t as safe without Toon Kingdom and having the actual Toon World is nice to have, despite one of Pegasus’s Skills. Relinquished can probably become its own deck type if Speed Dueling actually gets Senju and Sonic Bird released soon, with cards like Sphere Kuriboh and Relinkuriboh helping if we also get those. Jar of Greed can make for some ok draw power in the game and Wild Tornado is the best Spell/Trap removal we’ll likely get for now. 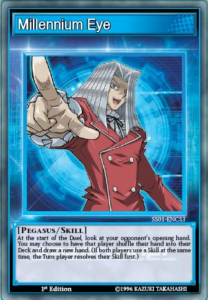 Pegasus has three Skills, one of which for Toons and the two others to match how he can see his opponent’s cards basically. It’s a Toon World is his first Skill and at the start of the duel it basically becomes Toon World and acts as a Continuous Spell in your Spell/Trap Zone. 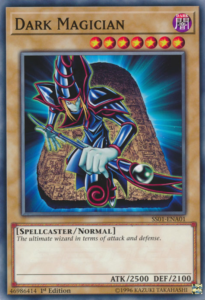 This helps Toons immediately get to Toon World without having to pay that 1000 LP cost to activate it, but it is still prone to destruction since it is now a Continuous Spell. Mind Scan is a Skill that activates at the start of the 3rd turn and if your LP is at 3000 or higher then you can look at your opponent’s set Spells and Traps at any time. This will likely be useful later on as more disruptive or dangerous Spells and Traps are added to the game so then you know if you should make a big play or push for damage with your monsters, for now there aren’t really any real threats for Spells and Traps that I can think of. 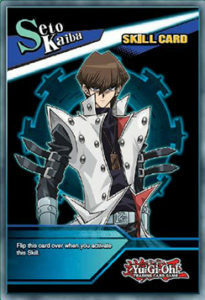 The last Skill is Millennium Eye which activates at the start of the duel (if both players have this Skill then the player that has the first turn uses the Skill first) and you basically get to look at your opponent’s opening hand and decide if they get to keep it or if they put it back into the deck and draw a new hand. This Skill basically means you can make sure your opponent doesn’t start with too good of a hand to counter what you do, and if your opponent doesn’t have a threatening hand at first then you already know what they have. This Skill is probably the best generic Skill right now as it gives you some important information before the duel starts. 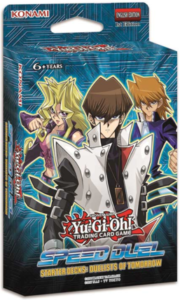 The second group of decks are for the characters that did not have the Millennium Items in the show: Kaiba, Joey, and Mai. Just like with the Destiny Masters Decks, you get three variant cards meant for each of the decks. Kaiba’s variant card is Champion’s Vigilance, which can be good in Blue-Eyes, Red-Eyes, and Dark Magician decks when those decks get enough support to become more viable. 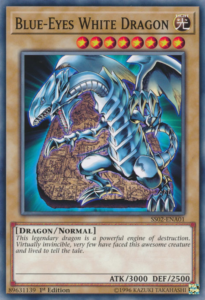 The card was already limited in Duel Links because of how good it was with Red-Eyes and it probably would be good in the game right now with Blue-Eyes, but the current Speed Duel format doesn’t have the cards that really make Red-Eyes meta, but I feel like we got enough to make Blue-Eyes an early meta deck. Joey’s variant card is Fusion Gate, which I can see being pretty useful in many Fusion decks down the line. Right now there are three Fusions in Speed Dueling and none of them are really worth making a deck around. Mai’s variant card is Amazoness Village, which is interesting since Duel Links never got this card, but Speed Dueling currently doesn’t have Princess or Onslaught or Queen, which made Amazoness meta in Duel Links. Village will still be a good card to make your Amazoness monster’s into floaters, but I wonder if Konami learned from Duel Links and probably won’t release cards like Princess, Onslaught, or Queen until much later in Speed Dueling’s lifetime. Kaiba basically has either strong monsters, or cards to help summon big Dragons. His deck contains Blue-Eyes White Dragon, Battle Ox (x2), Ryu-Kishin Powered (x2), Luster Dragon #2, Lord of D. (x2), Twin-Headed Behemoth, Tyrant Dragon, Spirit Ryu, Kaibaman, The Flute of Summoning Dragon, Stamping Destruction, Cost Down, Burst Stream of Destruction, Mountain, Interdimensional Matter Transporter, Dragon’s Rebirth, and Trap Jammer. Mix some of the cards in here with Yugi’s deck and you got something going with Blue-Eyes. Get three Blue-Eyes White Dragons, three Kaibamans, three Blue Dragon Summoners, and a few copies of Wonder Wand and you can easily get to the Kaibaman and Blue-Eyes White Dragon combo. Lord of D. and The Flute of Summoning Dragon is easier to pull off in 20 card decks, especially with one of Kaiba’s Skills. Luster Dragon #2 is the best tribute monster in the game right now. Battle Ox is the second strongest base ATK for a Level 4 or lower monster along with Double Coston. Stamping Destruction can be nice Spell and Trap removal for Dragon decks. Twin-Headed Behemoth is going to be the best tribute fodder we have for a while I assume. Interdimensional Matter Transporter can help your monsters dodge effects. A big card excluded from being in this deck is Enemy Controller, probably cause Konami knows how good of a staple it was in Duel Links, so they’ll likely put it in a set so you have to pull it. Kaiba’s Skills are based around Dragons and High Level Monsters basically. Peak Performance is basically like Power of Dark where instead of acting like Yami, this Skill basically becomes Mountain and gives your Dragons, Winged Beasts, and Thunder monsters 200 ATK and DEF. This can be nice in some decks with a lot of Dragons to really make them more threatening. 3200 ATK Blue-Eyes doesn’t sound like much over 3000 ATK Blue-Eyes, but it can make a difference. Beatdown! 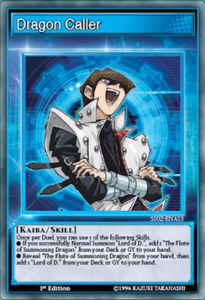 is Kaiba’s other Skill and it can be activated during each of your turns where you can boost all Level 5 or higher monsters you control by 300 ATK for each Level 5 or higher monster you control and at the end of the turn, you flip the Skill back over to use it again. This helps decks that can spam out High Level Monsters OTK with greater ease. It’s seen success in Duel Links, especially before it was nerfed when it boosted every monster by 300 per Level 5 or higher monster you control, so I can see here they brought the nerfed version to Speed Dueling, but it’ll still be a good Skill. Dragon Caller is Kaiba’s last Skill and it basically has two effects, but you can only activate one of the effects once per duel and it makes it to where if you successfully Normal Summon a Lord of D. then you can search for The Flute of Summoning Dragon or you can reveal The Flute of Summoning Dragon in your hand to search for The Lord of D. This Skill makes the combo between The Lord of D. and The Flute of Summoning Dragon much easier, meaning you’ll just need the Dragons and one of the two cards previously mentioned. Dragon Caller might actually see use in Dragon decks, but I don’t know how successful it’ll be since it wasn’t in Duel Links previously, so Speed Dueling in real life is all the experience I’ll see with the Skill in action. Joey’s Deck is built around Fusion Summoning and is the only deck to come with Fusions. In the deck you get Red-Eyes B. Dragon, Meteor Dragon, Flame Manipulator, Masaki the Legendary Swordsman, Alligator’s Sword, Baby Dragon, Time Wizard, Little-Winguard, Copycat, Gearfried the Iron Knight, Polymerization (x2), Stray Lambs, Legendary Sword, Sogen, Dicephoon, Graceful Dice, Skull Dice, Kunai with Chain, Red-Eyes Spirit, Flame Swordsman, Thousand Dragon, and Alligator’s Sword Dragon. We now see the strongest base ATK for a Level 4 or lower with Gearfried the Iron Knight. It is interesting we didn’t get a Skill to act as Sogen so we don’t have to play Sogen, but oh well. Kunai with Chain is the best defensive and offensive Trap in the Speed Dueling format I guess. 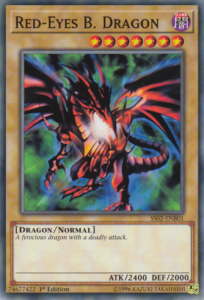 Red-Eyes B. Dragon and Red-Eyes Spirit gives us two important pieces as to what made Red-Eyes meta in Duel Links, but we are missing Red-Eyes Insight to help that. Copycat can help crash with strong monsters if you don’t have one strong enough already. Stray Lambs will help stall out the game with those two Tokens. Joey has the weakest of the decks if I’m being honest. Where Joey failed to have a good deck, he has some great Skills even though most of them are luck based. Grit activates at the start of your turn and makes you call two numbers and then roll a six-sided die and if you rolled a number you declared, then your LP can’t go below 1 until the end of your opponent’s next turn and this Skill can only be used once per turn. Pretty luck based, but it can buy you some time if you are really low on LP and are about to lose the duel. You got a 33.33% chance of survival if you call the right number, which I guess the dice makes up for the fact that you don’t have a computer deciding if the Skill will work or not like in Duel Links. Last Gamble can be activated at the start of the 5th turn (counts both players) and during your Main Phase you can reduce your LP to 100, discard two cards from your hand, and roll a six-sided die and draw cards equal to the number you rolled. This is very high risk with high reward. You can basically give up most to all your LP and two cards just to roll a 1 and get one card, or you can roll a 6 and get six cards. Some decks might be able to make good use of this, but again it is risky. It’ll probably be one of the better Skills in some decks because they can set up the grave for some plays maybe. It only being able to be used after the 5th turn does make sense as well to keep it more balanced. Pal-O’Mine-zation! 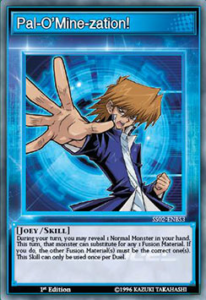 is Joey’s last Skill and it fits with the Fusion Monsters he has where once per duel, you can activate this Skill to reveal a Normal Monster in your hand and the turn you reveal it, it can be used as a substitute for any Fusion Material specifically listed on a Fusion Monster as long as the other material is correct. At least we got a way to turn monsters into substitutes for Fusion Materials, it just has to be Normal Monsters. I can see this being useful if you are just ripping the decks open and playing them without editing, but I don’t see a home for this with future releases. I could be wrong and a Fusion Deck in the future like Gem-Knights or something can make use of it, but for now I don’t know how good it’ll end up being. I like the concept, though. The last deck to talk about is Mai’s Deck, which is a mix of her Harpie monsters and her Amazoness monsters. In the deck you got Harpie Lady 1, Harpie Lady 2, Harpie Lady 3, Harpie Lady Sisters, Amazoness Chain Master, Amazoness Swords Woman, Amazoness Sage, Birdface (x2), Sonic Shooter, Elegant Egotist (x2), Triangle Ecstasy Spark, Cyber Shield, Harpies’ Hunting Ground, Amazoness Heirloom, Amazoness Archers, Windstorm of Etaqua, Shadow of Eyes, and Wild Tornado. 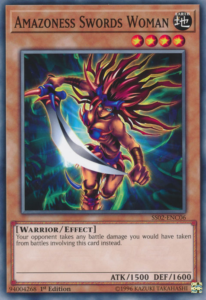 A Harpie and Amazoness deck might work once you see the Skills, so Harpie Lady 1 and Amazoness Swords Woman will likely be your go to for a deck like that. Amazoness Sage will be nice as well in that deck for Spell/Trap removal and Birdface can search for your Harpie Lady 1. Elegant Egotist can help you have 2 Harpie Lady 1s out at the same time for two 1900 bodies. Harpies’ Hunting Ground might be a one of with Amazoness Village in said deck. Amazoness Heirloom might be a useful Equip Spell and Amazoness Archers can annoy the opponent more. I can also see Amazoness Swords Woman going into burn decks as well since your opponent takes the damage from her instead of you. Windstorm of Etaqua will be annoying at three in Stall Decks, I don’t know how annoying though since Duel Links only has one of it and one of Curse of Anubis (which might not enter Speed Dueling with three Etaqua). Mai’s Skills worth with Harpies and Amazoness as well as her having a Skill to throwback to when she used perfume on her cards to know what she was drawing. Aroma Strategy is her first Skill and it activates at the start of the duel and lets you look at the top card of your deck at any time. No restrictions whatsoever, so you can always know what you’ll draw next. This might be a great Skill when an archetype like Hazy Flame comes to Speed Dueling, but knowing what you’ll draw next is always nice for planning ahead. Flight of the Harpies in short is basically Gravekeeper’s Lot only instead of getting a Gravekeeper’s monster, you get a Harpie monster and the rest of the Skill is a copy and paste. So you can immediately get to your Harpie Lady 1 or maybe Harpie Lady 2 or 3 if you want to play those, but that’ll in turn limit you on the amount of Harpie Lady 1 you can play. Tribal Synergy is a Skill that basically acts as two Skills as it has two effects you can use in a duel. If you have a Harpie and Amazoness monster in your hand, you can reveal them to draw a card and if you have a Harpie and Amazoness monster face-up on your field you can draw 2 cards. Once again you only get both those effects once per duel, but it adds to the draw power of a Harpie/Amazoness hybrid. 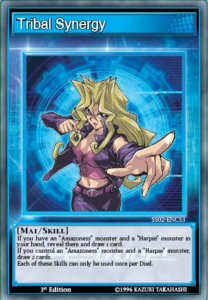 I can see people actually mixing Harpies with Amazoness just for this draw power to get to Spells and Traps or maybe more monsters as we get more Harpie, Amazoness, and generic cards. A pretty good Skill that actually makes playing both Harpies and Amazoness worth while. For now it seems they are starting off Speed Dueling similarly to how they started Duel Links only with a few differences. It’ll be interesting to see what cards they release for a format like this in real life after learning from experience with Duel Links. I can see this working as a good side event at tournaments. These decks help lay the foundation for Speed Dueling in real life and as we get more Speed Dueling sets, we can expand and find new decks to play in this environment. What was never meta in the TCG might become meta in Speed Dueling with a smaller deck, some Skills, and less competition to deal with. I can see this succeeding very well and I can’t wait to do an article when the first set for Speed Duels is released.